Whether you wish to pave your driveway or need assistance with your contracting project, CHOATE CONCRETE is here to help. Using the latest volume metric technology, our professionals come to your location to mix your concrete with the utmost efficiency in order to save you time and money. Our specialists mix professional-grade concrete to keep your property in pristine condition. 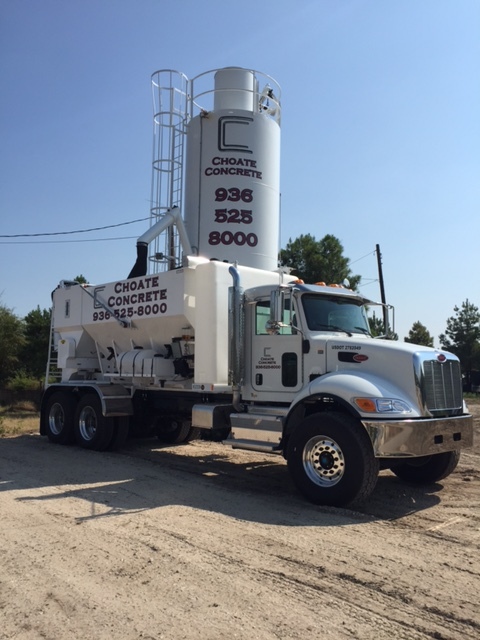 Eliminate the hassle and expense of mixing your own concrete when you call upon the experts at CHOATE CONCRETE. Based in Conroe, Texas, our company offers mobile ready-mix concrete services for residential and commercial clients throughout the area. Our professionals pride themselves on providing fresh-mixed concrete using a state-of-the-art volume-metric machine to ensure the perfect amount and consistency every time. We are dedicated to the needs of our customers. Our team is always on time for every project and never fails to return your phone call in a timely manner. We even offer 24-hour delivery for your utmost convenience.